“Who can speak for her, for what she feels? 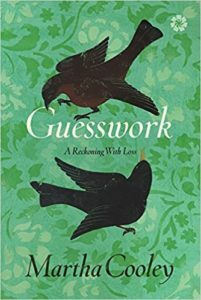 One can only guess,” Martha Cooley meditates on a statue of Madonna in Guesswork: A Reckoning with Loss, her memoir in essays. Indeed, the collection itself is a series of guesses, an exercise in guesswork, turning questioning into an artwork, of threads pulled tight and looms undone, of confessions and silence, of understanding and what lies beyond or outside of it. Cooley is most at home in liminal states of mind; one could say these are her solid grounds, where she is able to find meaning in uncertainty – or at least find comfort in multiple options. The book pivots around Cooley’s time living with her husband in the tiny Italian village of Castiglione while on sabbatical, but it pirouettes around themes of death and dying, observing these experiences in humans and the parade of animals who surround them in the village, from bats to geese to mangy cats. Death is the past, present, and the future. Past: the death of her husband’s first wife, a close friend of hers. Present: The resident of the village’s castle, dying and writing his way to it, poem after poem. Future: Her mother, now living in a nursing facility, blind for decades, moving towards death, and her father, starting to lose the present due to dementia. This is a book about survival strategies, about how our communication with one another is inadequate, about how our bodies are the ultimate vehicles of conveying our state of being. Walt Whitman put his finger on the challenge in “To Think of Time” a poem in which he asks “If I were to suspect death I should die now/Do you think I could walk pleasantly and well-suited towards annihilation?” That image of Whitman strolling towards his own extinction like a relaxed flaneur makes me smile. Such was his intent, I suppose – to make me realize how much, despite my boasts to the contrary, I fear time’s passage. And how futile my resistance is. “I loved the notion of two states divided by flowing water, a river in neither one place nor another,” she writes of the Delaware River dividing New Jersey and Pennsylvania when she would visit her grandmother as a child. There is a parallel here: This is a book about neither Italy nor the United States, divided by the Atlantic; this is a book that straddles both places, a book that focuses on roots and root-making, on roots being torn up by death, roots being preserved, and roots being created by new life choices. “What if I bungled my life’s chances, or, worse, became too scared or sad to try?” Cooley asks, thinking about her grandmother reading her a T.S. Eliot poem when she was a teenager. And yet we, readers, know she has not bungled her chances, is indeed living them out in what we are reading, and indeed extending them through writing so that we, readers, may go along with her on the journey. The question becomes another lattice in the guesswork that she is constructing, a beautiful, solid foundation for meditation. “Acknowledging the obviousness of something I’d overlooked, I felt a light sweat break out on my forehead,” she writes, thinking about the silence at the heart of her book, wondering what her mother will think of it. She is afraid of missing the obvious, and yet when she does, it is only because she is immersed deeply in showing us what is not obvious, in a looking beyond that has tremendous power of its own. This is a book about the motion that none of us can stop, which takes us only in the direction of the future, and about celebrating the present despite what we have lost, perhaps even because of how what we have lost has shaped our forward path. Cynthia-Marie Marmo O’Brien writes and edits in New York. Her nonfiction on faith, depression and the imagination from the Bellevue Literary Review was a notable selection in Best American Essays 2011. She has contributed to America: The National Catholic Review, Killing the Buddha, The Los Angeles Review of Books, Narratively, Real Pants, The Rumpus, and Words Without Borders: Dispatches, among other publications. A graduate of Columbia University’s MFA program, she has taught writing in the United States and Europe. Find more from her at her website or @CMMOB on Twitter.